"Should Iraqi Kurdistan have open diplomatic relations with Israel?" 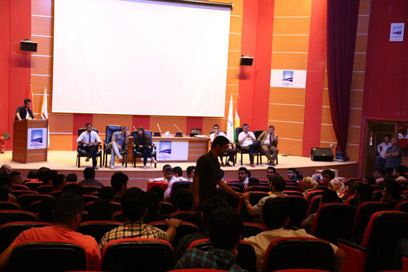 Students in the University of Kurdistan think the answer is yes, at least that is the position that won during an unusual debate held in the university in Erbil, the capital of Iraqi Kurdistan. More than 200 students from all of the university's faculties showed up to take part. In the event, two teams numbering three people each faced off in front of a judges' panel. Susan Mandelvey, head of the university's public relations and one of the members of the judges' panel spoke to Ynet and said: "We see ourselves as an institution in which people can openly express their opinions." At the end of the debate, the judges' panel decided that the team arguing for relations with Israel was victorious, and afterwards the audience echoed their decision vehemently voting in favor for relations with the Jewish state. Another judge in the Erbil debate said: "The arguments of the winning team focused on the historic relations between Jews and Kurds. I also believe that we can have good and fruitful relations with Israel." Nonetheless, she diplomatically evaded giving further details on the character of those relations when pressed for an answer, saying "because I judged the debate I am barred from fully stating my own opinion. I need to remain neutral." Iraqi Kurdistan was formed in the wake of the 1991 Gulf War. Its formation was further spurred by the American invasion of Iraq in 2003. Iraqi Kurds, who number around five million, enjoy the highest level of autonomy of the entire 30 million strong Kurdish population spread world wide, located mostly in Iran, Syria and Turkey. In wake of Kurdish aspirations and independent identity, tension between the central regime in Baghdad and Masoud Barzani, Iraqi Kurdistan's regional government president since 2005, have become common. Head of the university's student union, Uda Sarhang, a student of international relations, recalled the debate and said: "The central argument for those calling for open ties with Israel was that a majority of Mideast countries have ties with Israel; ties conducted peacefully despite their dislike of Israel. So, why can't we have the same ties?" 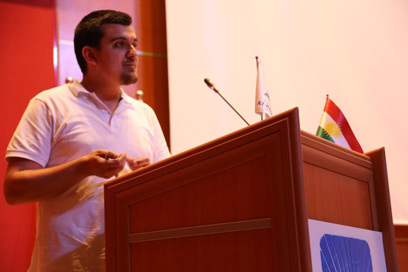 Sarhang, who admitted to also supporting the idea of ties with Israel, claimed that an additional argument made during the debate was the current relations conducted by Jewish Kurds and Kurdistan. Despite the victory registered by those in favor, there were of course those who vehemently opposed the forging of any such type of relations. "A number of the arguments that were made against the relations were religious claims, as well as additional arguments regarding Israel's treatment of Palestinians," Sarhang said. Prof. Ofra Bengio from Tel Aviv University's Dayan Center, who conducts extensive research on the topic of Kurds in the Mideast, spoke to Ynet and said that the debate was indeed a very unusual occurrence. "This is not a common thing, not in Kurdistan and not anywhere," Prof. Bengio said, adding that "from what I gathered from meeting Kurds from different regions of Kurdistan, there is some kind of sense of a shared fate between us and Kurds, at least in the sense that we are both minorities in a region not interested in our self-determination." Regarding the question of whether Kurdistan should have diplomatic ties with Israel, Prof. Bengio said: "Both sides are hesitant. The Kurdish side has strong interests dictating that it should not pursue ties with Israel, first and foremost because Kurds still don’t have a state, and hence cannot really forge diplomatic ties with Israel." Nonetheless, it is worth noting that in 2008 history was made when Iraq's president, Jalal Talabani, a Kurd, shook the hand of then Defense Minister Ehud Barak during an international summit in Greece. Afterwards, in wake of the handshake, Iraqi parliament members called on Talabani to apologize and resign. 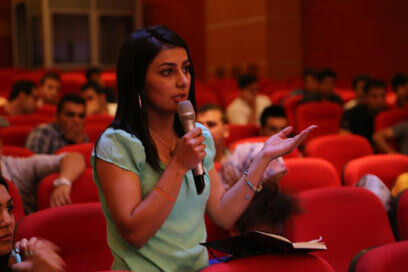 See all talkbacks "Kurdish students in Iraq push for relations with Israel"